This Swingline Stack-and-Shred 300X Auto Feed Cross-Cut Shredder with SmarTech revolutionizes office shredding. This auto feed shredder sends real-time status updates straight to your phone or tablet, freeing you up to do other tasks while the 300X does the work. With the easy-to-use SmarTech Shredder app, you’ll be able to keep track of shredding with notifications if the shredding job is interrupted for any reason, and when shredding is completed. The Stack-and-Shred 300X shreds up to 300 sheets with automatic shredding and up to 8 sheets at a time during manual feed shredding. It auto shreds documents, paper clips and staples and manually shreds credit cards, DVDs and CDs. It features a large, 11-gallon pull-out waste bin with bin full indicator and attached wheels for easy mobility. Some other user-friendly and intelligent features include Auto+ Jam Clearance, Self-Cleaning Cutters and Power Save for virtually effortless shredding. The Swingline Stack-and-Shred 300X is backed by a 2-year warranty on machine and 15-year warranty on cutters. Time-saving shredder with SmarTech lets you shred faster than ever – just stack, shut and walk away with peace of mind that your job will be completed. SmarTech functionality sends real-time shredding status updates to your phone via the Smartech Shredder App. Notifications include “Shredding”, “Paper Jam”, “Job Complete” and more. Features easy setup with no IT required; simply download the app from iTunes or the Google Play Store and pair your device. Administrators can manage multiple shredders at once. Real time status updates indicate if shredders are jammed, bins are full, or oil is low. The app also allows for quick reordering of supplies to simplify maintenance. Super cross-cut shred style has added security (Level P-4) for sensitive documents. PIN protected lockable paper chamber keeps documents secure while jobs are in progress. Shreds up to 300 sheets with automatic shredding and up to 8 sheets at a time during manual feed shredding. Features a large, 11-gallon pull-out waste bin with bin full indicator and attached wheels for easy mobility. Ultra quiet (=60dB) shredder runs consecutively for 30 minutes on with 30 minutes off to ensure motor’s longevity. Includes user-friendly, Intelligent features like Auto+ Jam Clearance, Self-Cleaning Cutters and Power Save for virtually effortless shredding. Auto shreds documents, paper clips and staples; manually shreds credit cards, DVDs and CDs. 2 year warranty on machine, 15 year warranty on cutters. 18.5"L x 13.75"W x 25"H.
This is an excellent shredder. I shred a lot and this machine seems to be doing a great job. Why would you want to have to stand in front of a machine and feed it paper when you can lift the lid and drop in a nice big stack of paper and close it up and walk away? This is the machine for you to buy and take care of your shredding needs period.But if you want to then it also has a manual feed slot for that also. What more do you need? This shredder has high capacity and yet safety and overload protections that prevent over taxing the reasonable capabilities. For example, when clearing tax files from a prior year - and entire file drawer of paper needed to be shredded. After the 2nd or 3rd bunch of 250 pages, the overheated light comes on and the shredder waits to cool down before re-engaging the cutters. The drawer full light works well so that I do not have to constantly watch for the bin to be too full. After a few years of use, the shredder continues to operate flawlessly. Previously, I would wear out a normal shredder within a year's use. Thanks Swingline for a superior product. Using the Swingline Shredder, it was able to handle all the shredding needs of all confidential and sensitive documents. Old credit cards shredded in seconds without cutting your fingers using a traditional method of cutting with scissors. Large shredding projects that would take months now take days since the shredder can shred staples and small paper clips attached to the paper. The crosscutting gives a person the security of knowing that the papers could not be reassembled. It is a win-win decision to purchase this shredder. I love being able to stack a pile of paper in this this thin and forget about it! Best shredder I've ever had!!!! Introducing the new Stack-and-Shred 250X Hands-Free Shredder. It's a better way to shred. The 250X is ideal for small to medium offices or shared spaces, shredding up to 250 sheets of paper automatically. The patent-pending hands-free auto-plus technology means that shredding tasks are now as easy as stack, shut, done. Standing in front of the shredder is a thing of the past. The Stack-and-Shred 250X features cross-cut shredding and can even shred CDs and credit cards. A four-digit programmable PIN lock offers extra security for confidential documents so you can attend to other business. Just enter any four numbers and the shredder will not open again until the job is completed. The PIN number resets every time so you can be sure your information is being securely shredded. Automatic jam clearance, automatic power save and self-cleaning are just some of the features designed to make the operation and maintenance of the Stack-and-Shred 250X a breeze. Don't waste your time standing in front of a shredder when you can be doing something else. 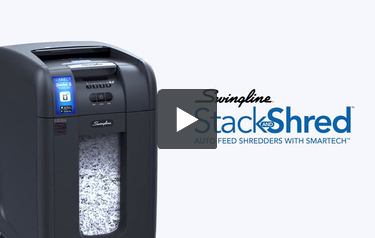 It's time to delegate the shredding to your shredder with the new Stack-and-Shred 250X from Swingline. Transcript: Speaker 1: Thank you for tuning in on the training video for the new 250X. The 250X is one of four exciting new Stack-and-Shred shredders from Swingline for the year 2012. I’m Stever Frei. I’m here to introduce the video, and I will follow up with you after the video with a couple of additional points. So with no further ado, let’s move you right into the video and check out the new 250X. Speaker 1: Thank you for tuning in on the training video for the new 250X. The 250X is one of four exciting new Stack-and-Shred shredders from Swingline for the year 2012. I’m Stever Frei. I’m here to introduce the video, and I will follow up with you after the video with a couple of additional points. So with no further ado, let’s move you right into the video and check out the new 250X. Speaker 2: Introducing the new Stack-and-Shred 250X Hands-Free Shredder. It’s a better way to shred. The 250X is ideal for small to medium offices or shared spaces, shredding up to 250 sheets of paper automatically. The patent-pending hands-free auto-plus technology means that shredding tasks are now as easy as stack, shut, done. Standing in front of the shredder is a thing of the past. The Stack-and-Shred 250X features cross-cut shredding and can even shred CDs and credit cards. A four-digit programmable PIN lock offers extra security for confidential documents so you can attend to other business. Just enter any four numbers and the shredder will not open again until the job is completed. The PIN number resets every time so you can be sure your information is being securely shredded. Automatic jam clearance, automatic power save and self-cleaning are just some of the features designed to make the operation and maintenance of the Stack-and-Shred 250X a breeze. Don’t waste your time standing in front of a shredder when you can be doing something else. It’s time to delegate the shredding to your shredder with the new Stack-and-Shred 250X from Swingline. Speaker 1: Thank you for viewing the 250X training video, which is one of four exciting new Stack-and-Shred products as you know. The 250X is positioned to be sold into shared departmental environments. And the four-digit lock makes it an excellent product for more sensitive environments, such as legal offices, consulting firms, health care. So that’s a very important selling feature that was pointed out in the previous video. I hope you enjoyed the video. I hope you learned a lot, and I wish you good selling in the year 2012 with Stack-and-Shred. The Stack-and-Shred 250X has an excellent shredding capacity. This device can shred up to 250 sheets at a time so you will be able to get rid of your documents in a hurry. You can just stick them in the shredding area, close the lid, and they will be shredded instantly. If you just have a few sheets to shred, use the secondary feed opening that's on top of the device. This is a cross-cut machine with a Level 3 security rating for your peace of mind. The device can even shred CD's and credit cards which gives you additional security. The shredder's cutters are strong enough to tear up documents that still have staples and/or paper clips attached to them, which is convenient. Also, this machine has a unique password system that allows you to secure the shredder when destroying highly confidential documents. The Stack-and-Shred 250X can shred continuously for up to 30 minutes. It has the ability to clear up jams automatically so you won't need to waste your time clearing them yourself. 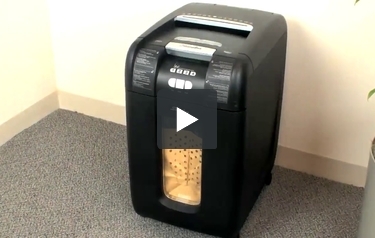 This shredder has an 11-gallon waste bin so you can share it with a co-worker or two or three. The waste bin can be pulled out like a drawer so getting rid of your shreds is really easy. The Stack-and-Shred 250X has a power-saving feature so you can save a little bit of cash on your electric bill. Other user-friendly features include quiet operation, a manual reverse mode, and self-cleaning cutters for easy maintenance. There are even casters on the bottom of the machine so you can transport it easily. Finally, this shredder is covered by a 2-year warranty. Although the Stack-and-Shred 250X can shred non-stop for up to 30 minutes, you will then need to give it a break. The machine will need to rest for 30 minutes, so make sure you plan your shredding accordingly. This shredder has self-cleaning cutters but it doesn't have an automatic oiler. Make sure your read the instruction manual to find out how often you should oil it. Keep in mind that you should only use shredder oil as other lubricants can cause problems. 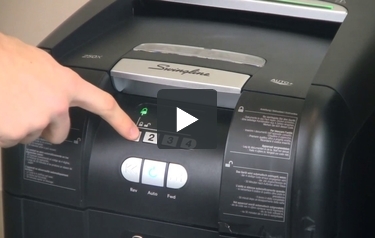 The Stack-and-Shred 250X is a welcome addition to Swingline's growing line of paper shredders. This machine has an abundance of special features such as the password system, an excellent shredding capacity, and the ability to take care of CD's and credit cards. Plus, you can share this device with a few co-workers and enjoy first-rate warranty coverage. You should take this shredder's weaknesses into account but if you think the Stack-and-Shred 250X is the shredder for you, check it out today. You will probably love it. We are looking for a lockable shredder which is PCI (payment card industry)? per PCI DSS version 3.1, section 9.8, "Hard-copy materials must be crosscut shredded...". You can achieve this with the 300X shredder identified in your post as it is a Super Cross-Cut shredder with a security level P-4. The second part of the question, lockable shredder; the 300X only locks temporarily with a PIN code and will unlock automatically when the PIN code is reentered or 30 minutes of idle time has passed. The front door of the 300X does not lock with a key. However, once shredded, the material can then be moved to a secure storage location. How do I clean the bin full indicator? It thinks its full when its empty and refuses to run. the bin full indicator on the 300X is triggered by a mechanical flap located directly below the cutters, inside the cabinet. Be sure to turn off the power and unplug the machine from the wall. Open the front door and pull out the bin. The mechanical flap may be stuck due to some debris being caught. Locate the flap and wiggle it gently to remove any debris. Hi I am trying to reset the code that was not supposed to be set, can it be reset or just taken off? The shredder allows you to set a new four digit PIN code with each use, so it is automatically reset when shredding is finished. How does an auto feed shredder shred junk mail? Shred junk mail quickly and easily using the auto feed function of the Stack-and-Shred® shredder. Is this model PCI compliant? Hello, per PCI DSS version 3.1, section 9.8, "Hard-copy materials must be crosscut shredded...". You can achieve this with the 300X shredder identified in your post as it is a Super Cross-Cut shredder with a security level P-4. The second part of the question, lockable shredder; the 300X only locks temporarily with a PIN code and will unlock automatically when the PIN code is reentered or 30 minutes of idle time has passed. The front door of the 300X does not lock with a key. However, once shredded, the material can then be moved to a secure storage location. Hello, the bin full indicator on the 300X is triggered by a mechanical flap located directly below the cutters, inside the cabinet. Be sure to turn off the power and unplug the machine from the wall. Open the front door and pull out the bin. The mechanical flap may be stuck due to some debris being caught. Locate the flap and wiggle it gently to remove any debris. This should fix the problem. Is there a way to rest the code or just take the code off? How often does this need oiled and where do I get oil sheets? Hi Slade - thanks for your question. We do not recommend oiling your Stack-and-Shred shredder as it could cause the rollers to have problems grabbing the paper during the auto feed operation over time.